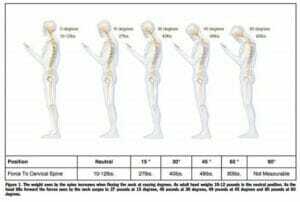 Text Neck is a repetitive stress injury or overuse syndrome to the neck caused by holding your head in a forward and downward position for extended periods of time. Excessive amounts of tension are created in the deep muscles of your neck and across the shoulders leading to neck pain. Headaches have also been linked to this condition. Due to the increasing popularity and hours people spend on handheld devices such as smartphones, tablets and on laptops Text Neck numbers are on the rise. Poor posture. The average weight of head is 5Kg which makes up 8% of the whole body mass. That is a lot of weight that the neck muscles and ligaments need to move and support! 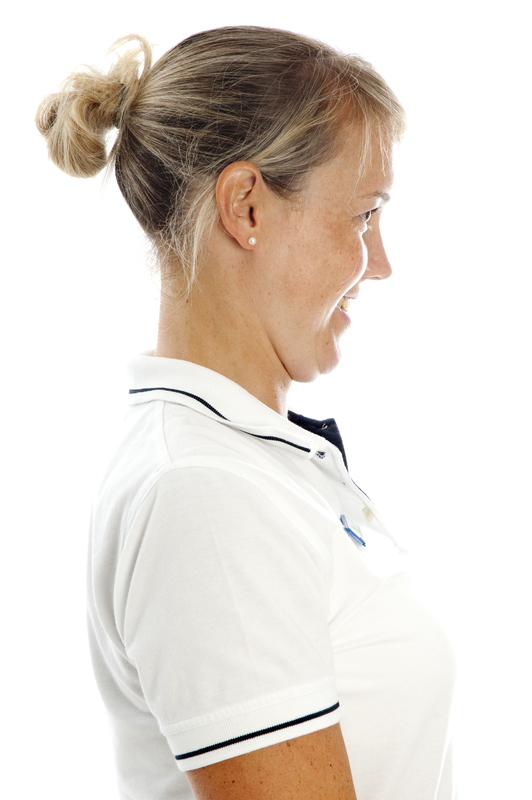 The weight of the head dramatically increases if you get into poor postures. As much as 6 times the force can be generated if the neck is not in a neutral position (same weight of an average 8 year old). Dr. Kenneth K. Hansraj, Surgical Technology International finds that texting can add up to 50 pounds of pressure on a person’s spine, depending on the angle at which the person is texting. 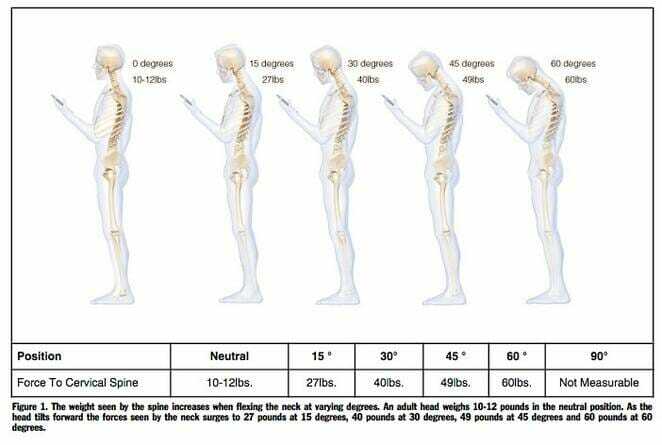 Text Neck’ can lead to the inflammation of the neck ligaments and nerve irritation. 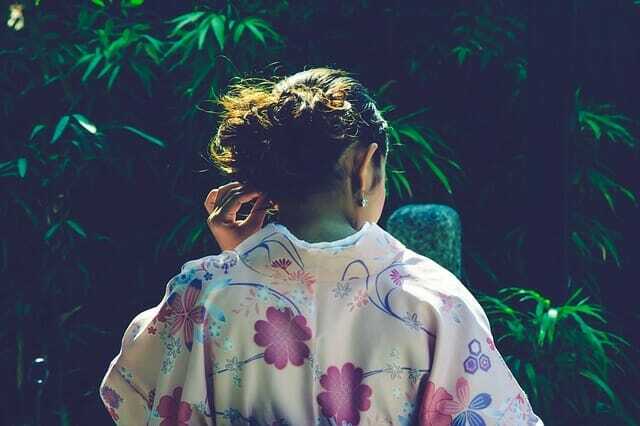 The main aims of treatment are to reduce the pain in the neck, the tightness within the neck muscles, and change the postures that aggravate your symptoms. 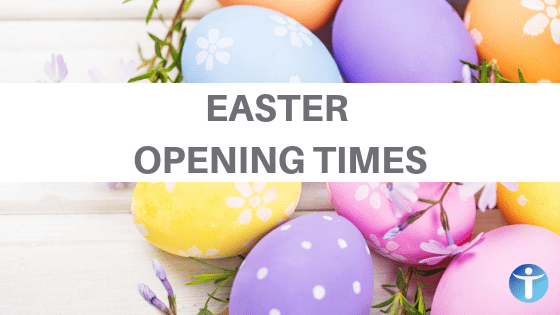 Please be aware of your body and take advice from your GP before exercising if you have any aches or pains or send me an email enquiries@physio-logical.net for advice and guidance. If you have Text Neck, we can help.